This is a research paper that was presented at the Global Investigative Journalism Conference 2017 Academic Track, which IJEC organized and covered. For more research and coverage of GIJC17, see here. Corruption in public spending poses a big obstacle in the efficient spending of public money (taxes). Therefore, it is crucial that government tenders can be monitored on a structural, rather than on an incidental basis. However, the basic mechanics of corruption in public spending varies greatly between countries, even within Europe. One of the most obvious red flags of a corrupt tender is the ‘sole bidder’. If a state-owned hospital in Slovakia would want a particular company to deliver the CT scanner, it would tailor the tender description so no other company can sign up for the competition. However, if a Dutch municipality would want a particular company to win a tender it would call other companies to submit pro forma applications and the sole bidder is therefore obstructed by dummy applicants. As such, the average number of bids per tender in Slovakia is 1, as opposed to 5 in the Netherlands. Therefore, the red flags manifest themselves differently. This paper explores the differences between these manifestations of red flags of corruption in similar public spending markets in Slovakia and The Netherlands using network (graph) visualization. 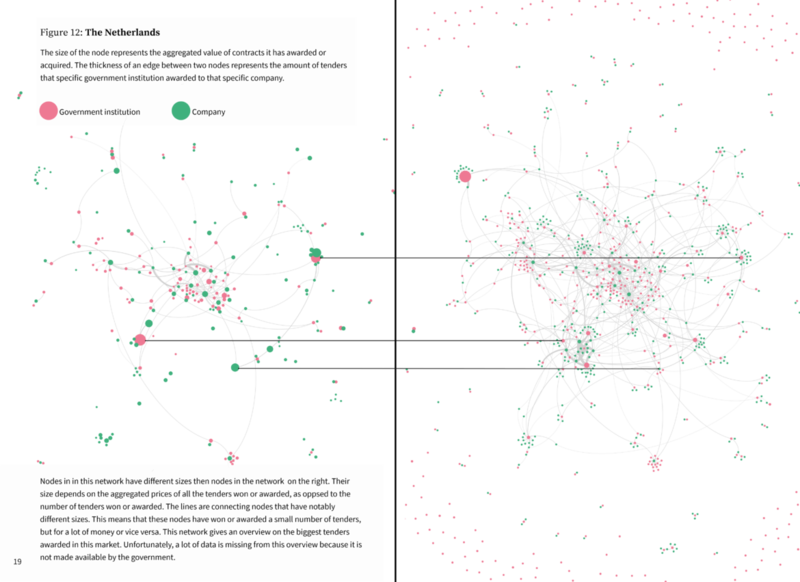 Given the complexity of spending data, visualizing the interaction between companies and public bodies as networks provides a quick and more approachable way on how to spot red flags. These methods could aid in finding new directions and practices to uncover corruption on a more structural basis and help journalists to find Ariadne’s thread in the maze of public spending markets. The primary source of government revenue is taxes. Simply put, the government manages tax revenues collected from inhabitants and businesses and allocates them to social security programs, public projects and its own operation. Since the government does not have all the expertise and manpower to execute most of the services it provides, such as infrastructure or security, it purchases goods and services from private companies. This process of acquiring goods and services by the government is called tendering, public procurement or public spending. Government spends a lot of money. Figure 1 shows how much euro per capita the EU member states spend in a year. To ensure appropriate quality and price of the services, public office publishes a tender and (eligible) companies send a competitive proposal. The proposals are evaluated based on the quality of services offered and their price. The best offer is chosen as winner. A fair competition should ensure that the government will get the best value for money. The rules for competition vary according to the estimated cost of a tender. Broadly speaking, the tenders of the lowest value can be awarded directly without any competition (direct procurement). Whereas tenders of a medium value are awarded in procedures with simplified competition rules, such as shorter deadlines or less demanding selection rules (OECD 2010). 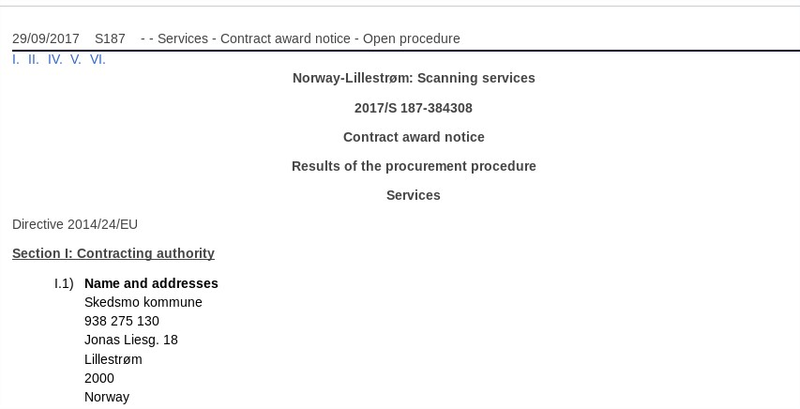 Tenders with an estimated price above the 100 thousand or 200 thousand euros, depending on the government body, are called the EU tenders. EU tenders adhere to the unified rules specific for EU tenders and need to be open for international competition. Apart from the EU tenders, member states set another two or three tender value thresholds below the 100 or 200 hundred thousand threshold, depending on the member state. The less expensive the tender is expected to be, the less competition is involved in the process. In these cases, the government can for example, choose which companies it invites to send bids instead of calling for an open competition. Interestingly, the amount of tenders falling onto these lower thresholds greatly exceed the amount of EU tenders. The EU Public procurement indicators 2015 report estimates that the total EU member states public spending in 2015 was 2 trillion euros, whereas the EU tenders account ‘only’ for 450 billion euros, so about one fifth. Despite the overwhelming amounts of money our governments manage, structured overviews of public tenders are scarce. Data on tenders are often simply not published. For instance, the Dutch government institutions generally do not keep any structured track of tenders that are estimated to cost less than the EU tenders thresholds. While they do keep a financial administration, details on the tendering process such as why a company was chosen and who else took part on the bidding process are not recorded in a structured way. Another problem is that the data is quite complex and not standardized. As such, each tender has a wide range of attributes ranging from obvious ones, such as title, description, winner and price, up to attributes that require a deeper knowledge of the tendering process, such as selection criteria, type of procedure, GPA etc. This complexity leads to tables up to seventy attributes (columns) per tender, making it difficult to filter out important information for the less data savvy journalists. As a result, journalistic stories about misuse of public money are therefore predominantly based on isolated incidents rather than structural analyses. It is important that public spending data are easily accessible and understandable since national governments do not own money, but only redistribute money acquired from the tax payers. Therefore, the public should be well informed about which companies it is paying, how much it is paying them, and evaluate whether the services it gets in return are adequate. Only through transparency in the tendering process can the government and companies it hires be held accountable for the way it spends the tax payer’s money. Here, journalism plays a crucial role. This paper offers a simplified introduction and gives a concise overview on the availability and main problems concerning the data on public spending in the EU. Furthermore, it presents a method on how to visualize public spending to find interesting patterns. This paper uses two EU member states to illustrate the method, however this method is applicable on spending data of any country where these data is made available. The EU is collecting data on the largest tenders in their member states already since 1993. Member states are obliged to send a Contract Notice (CN) as well as a Contract Award Notice (CAN) for EU tenders to Tender Electronic Daily (TED), a tendering website of the EU. Companies can offer bids on contract notices published in TED. CN contains a brief description, requirements for participation, sector information, criteria and deadlines for submitting bids. After the tender is awarded, a Contract Award Notice must be provided containing details of the award such as the date of award, price of the winning bid, competition information and name of the winning party (one or more companies). An example of a part of CAN is given in Figure 2. The collection and accessibility of tender data for tenders under the EU threshold vary greatly throughout the EU. According to the Open Data index (OKFN 2016) only a handful of EU countries, such as Greece, have a downloadable, free, openly accessible and machine-readable record of actual and past government spending. In Slovakia, for instance, a public contract is not valid by law if it is not published on a designated national tendering website, which provides and overview of past and current tenders. These data are public, but it was only made machine readable by a local NGO. Other countries, such as Netherlands, do not collect information on the smaller tenders on a unified basis throughout the government institutions at all. As mentioned earlier, one of the biggest obstacles in analyzing tender data is the lack of structure. Given the tenders details are filled in by government officials without unified rules or technical restrictions, there are for example often more than one names for a given company in the data. These can occur due to usage or no usage of the local denomination for company (Inc, s.r.o., or B.V.), different spelling (BV or B.V., PWC or PricewaterhouseCoopers) and of course typos. Another example of such “dirtiness” in data is nonsensical prices of winning bids. An example can be found on the online application The Usual Suppliers which shows a single tender in Hungary costing 1.2 quadrillion euros, as can be seen in Figure 3. It is often difficult to know exactly what the original value was, if the problem was a misplaced decimal point, a space, and where this should be. While dirty data is a big problem, a perhaps even bigger problem is missing data, and most noticeably the prices of the winning bids. The chances of encountering missing prices depend on the national public procurement market dynamics. As we can see in Figure 4, Sweden, Netherlands, Finland, Ireland and the UK do not publish more than 50% of the winning tender prices. On the other side of the spectrum, Croatia, Hungary, or Slovakia publish nearly all of them. The Dutch government reasons, that how much the winning company bid on the tender falls under “company sensitive information”. In Slovakia however, publishing winning bids is a measure to prevent widespread corruption in public tenders. Except EU tender data, there is no union in publishing national tenders. Some countries publish a lot, some do not publish any at all. Moreover, even the data that is published suffers from inaccuracies and missing data. However, analysis can be done using data that is present most of the time. Government institutions, on the other hand, may prefer a certain company to win a tender due to purely practical reasons. For example, a school could be buying classroom books by a certain publisher and does not want to change all of them just because by law there needs to be a new competition after some years. Another example could be an IT-infrastructure put in place by one company that would require lots of training or a costly replacement of the whole infrastructure if another company is hired. Other reasons may include positive professional or personal experiences during previous contracts. However, none of these reasons are lawful as previous experiences do not count as eligible criteria for winning a tender under current legislation. Previous research (OECD 2, 2010) has identified various tender features that may signal circumvention of a fair competition, which have been termed as red flags. The simplest red flag is when only a single company applies for a tender. This way, no competition takes place at all. Other red flags can be too short or too long deadlines and decision speed, one company dominating the public spending in a certain market, companies registered in tax havens, or a procedure without a public call for bids (so-called negotiated procedure). Obviously, given the differences between sectors and countries, the meaning and manifestation of red flags differ from sector to sector and country to country. While for example catering can be offered by many parties for a comparable price and quality, specialized medical machines or supplies could be offered only by a single company. The same market in different countries, such as transport can have distinctive features. While landscape in Slovakia is hilly and mountainous, Dutch landscape is flat. This has implications for the costs of infrastructure. Given that different sectors have distinctive features, any red flags found in public spending data must be interpreted in the context of a specific sector and country. Moreover, no red flag can prove circumvention of the tendering procedure or even corruption by itself. Red flags can nevertheless, especially in the case of multiple red flags, provide a first sign or an impulse to investigate a tender, public office or a company. To demonstrate a way how to look at the tender data, procurement of IT services in two countries, Slovakia and The Netherlands will be compared. Data downloaded from local tendering sites will be visualized as multiple networks (graphs), where red flags will be shown. Generally speaking, there are notable differences between public procurement markets of these two countries. Slovakia is more transparent (see Figure 4) and publishes more complete data on bigger and smaller tenders. However, the Slovak procurement market is overall less competitive. There is also a relatively high media reporting on corrupt tenders. The Netherlands on the other side is less transparent about the spending and publishes information only on the largest tenders. Some governments do not publish the price of the winning bid as it is deemed “company sensitive” information. However, the competition for public tenders is higher and reporting on procurement corruption is relatively low. The IT sector was chosen as it is large and relatively comparable across borders. While there are different problems in procurement markets in both of the countries (as explained above), the joint problem in procuring IT projects in Slovakia and The Netherlands is a lack of domain knowledge in government institutions. This can lead to overpriced and eventually failed projects. There are numerous examples of projects like these analyzed in local media of both countries (Investico, 2017, DennikN, 2015). Local tendering websites from Slovakia and Netherlands (UVO and TenderNed) were filtered for IT contracts. Dutch data span from 2011 to 2016 and contain 7,703 tenders. 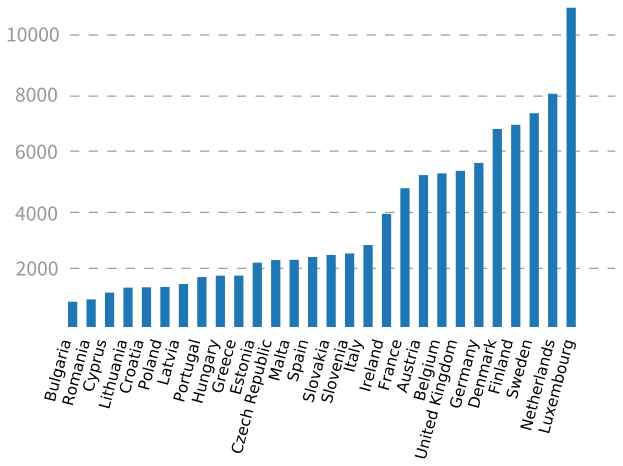 Slovak data span from 2009 to 2017 and contain 5,892 tenders. Duplicate company names were cleaned manually. A threshold for missing values was applied when visualizing the markets. Two red flags were chosen to display on the networks. Sole bidder is one of the most widely used red flags as it is very straightforward and easy to measure. Median amounts of bids from all the tenders for each company and government institution was calculated. If the median is 1, red flag is risen. The other red flag measure is the proportion of tenders under negotiated procedures per institution or company. In a negotiated procedure, government chooses companies that compete for the tender instead of offering an open call for bids. This procedure is lawful; however, it is less competitive than an open procedure. 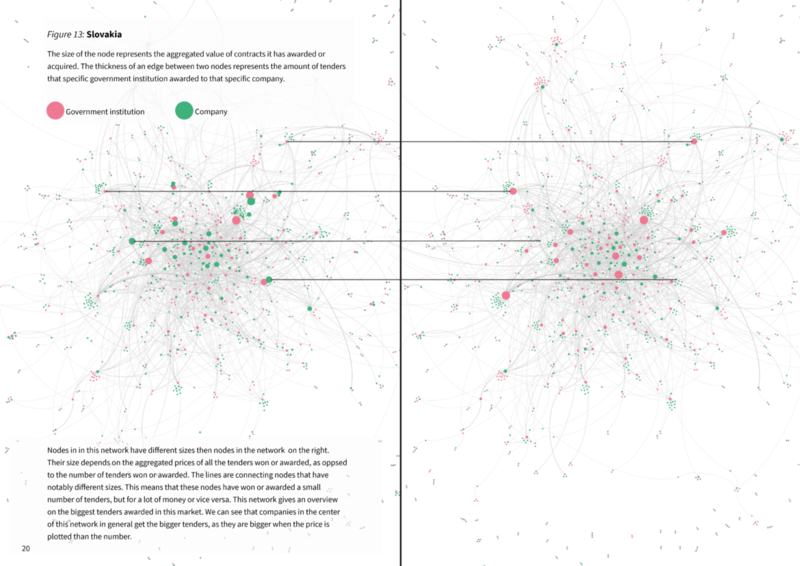 Visualizing the relationships between different entities results in networks. Network analysis has been used widely in journalism not only to show connections between different actors (such as connections between mafia members or connections between influential people ), but also to draw conclusion about behavior of groups (such as the Twitter communication divide between Trump and Clinton voters). Networks are comprised of so called edges and nodes. Nodes represent the actors and edges the type and strength of connection between them. This way, networks offer an instant visual overview of the market and their biggest actors (see Figure 5 for details). 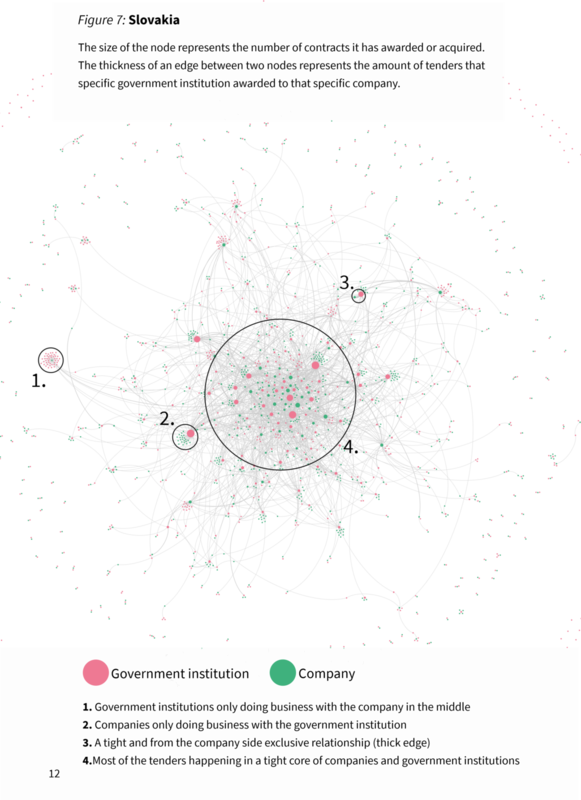 For our purpose, networks of tenders between companies and government institutions, will be visualized. Here the nodes are either companies or government institutions. Their size and color will represent different variables in different networks. The edge drawn from the government node to company node represents awarding of tender. 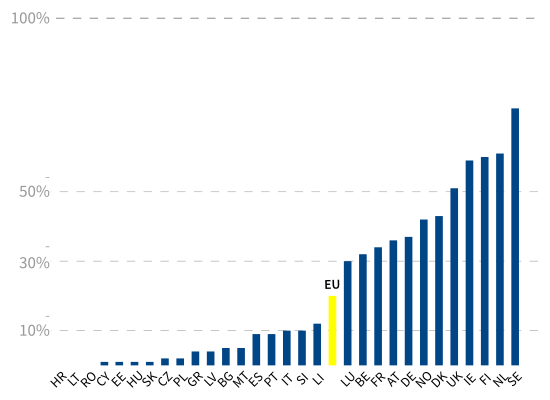 Its thickness is the number of tenders awarded (see Figure 5 for details). First, we will a look at the market structure of these two networks. 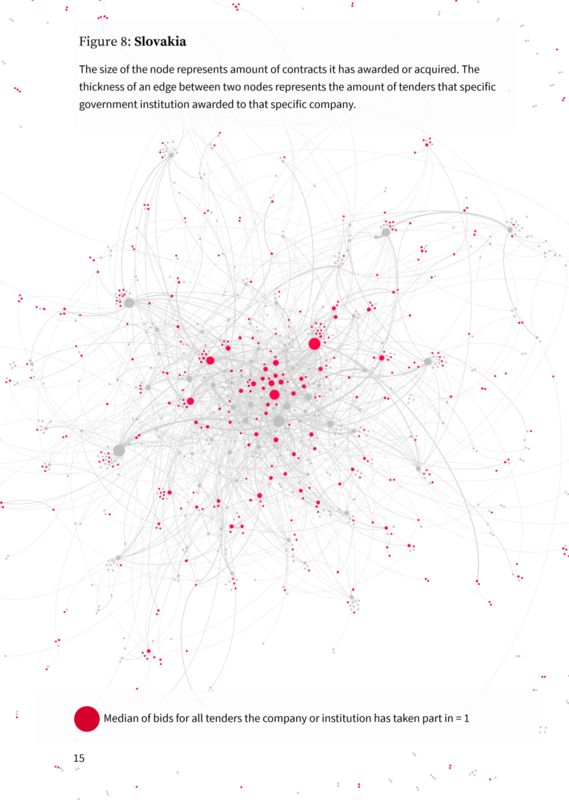 The color in this case represents the type of node, the size of the node is the number of contracts. See Figure 6 and 7 (pages 11 and 12). First, nodes where information on how many bidders took part in the bidding was missing were filtered out. Only nodes where in more than half the cases bidders were present stayed in the visualization. This filtering caused more than a half of the Dutch network to disappear, while more than two thirds of the Slovak network stayed visible. See Table 1 for details. Median amounts of bids from all the tenders for each company and government institution was calculated. If the median is 1, node became red. The difference between red flags present in these networks is big. While 7.3% of the nodes in the Dutch network became red, in the Slovak network it is 27%. It therefore seems that there is more competition in the Dutch IT market. See Figure 8 and 9 (pages 14 and 15). Similar to the sole bidder network, the first step in creating this network was to filter out missing values. Nodes stayed in the network if at least 25% of the winning bid prices were present in the data. This filtering caused only ¼ of the Dutch network to stay visible, while again, more than two thirds of the Slovak network stayed visible. See Table 2 for details. Afterwards, all the prices of tenders won were aggregated per node. The edges still reflect the amount of tender, not the aggregated price. We can clearly see the added value of knowing the price of the tender. While a company might have won just one tender, it might have gotten a lot of money for it. See Figures 12 and 13 for details (pages 19 and 20). Corruption in public spending leads to ineffective spending of public money. Therefore, government tenders should be closely monitored by the public. 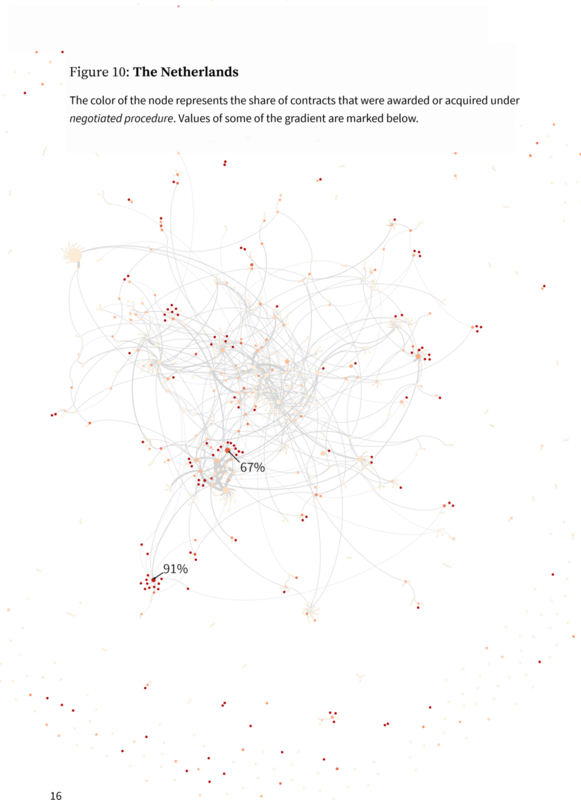 Visualizing public spending markets as networks gives an overview of the market members and offers a good method to detect possible corruption. While size of nodes and edges and their position in the network show the importance of individual companies and government institutions in the market, combining this overview with procurement red flags helps focusing on the prominent and suspicious members of the market. Two red flags were plotted on the network: sole bidder and the share of negotiated procedures. Both of these red flags measure competition in the market. These are, however, not the only red flags that could have been used. Companies registered in tax havens, duration of the tender or length of the tender description can also serve as a proxy for detecting corruption. Nowadays, only information on the largest tenders is available in many western European countries. Moreover, a lot of the data is missing. To have a more complete picture of the markets, the method would benefit from more complete data and information on the smaller tenders. Also, information on other companies that placed a bid on the tender would offer interesting insights into the competition. 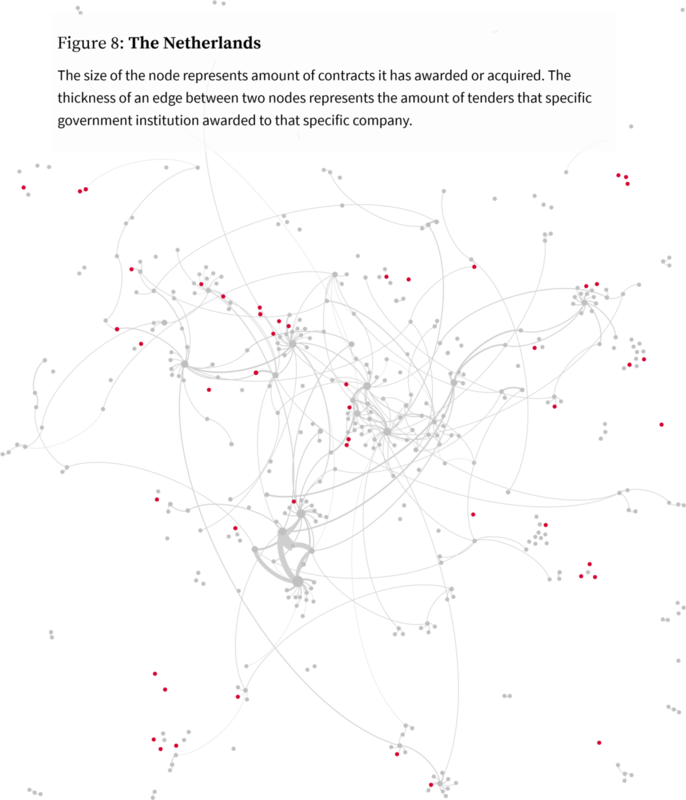 Combination with other data sets, such as company ownership data would allow for example to draw more connections between the companies and visualize collusive practices. 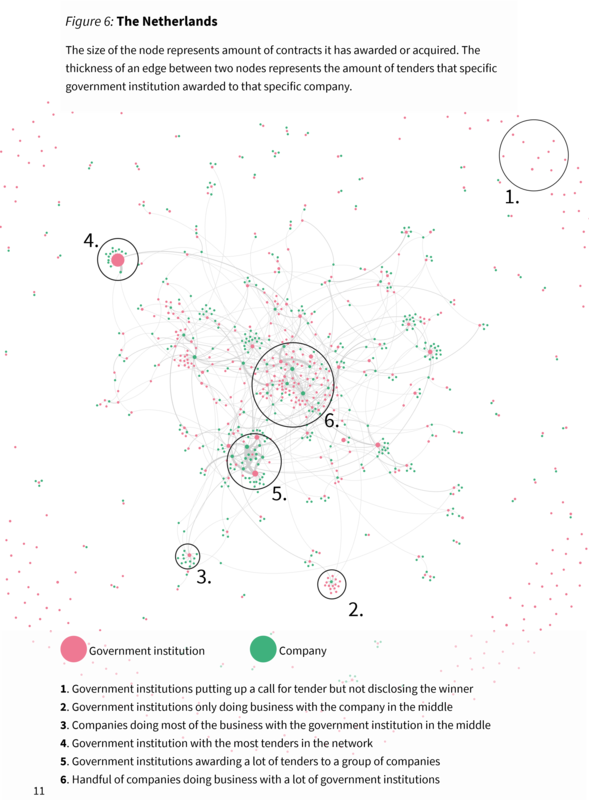 Visualizing public spending markets as networks, hand in hand with qualitative research and traditional journalistic methods has a potential to systematically uncover corrupt members of public procurement markets. As corruption in spending of public money has a negative influence on the welfare of the inhabitants, it is important that it is tackled and eradicated in a systematic way. Even if all EU countries are considered high income economies, even here corruption takes form of weak social safety nets or crumbling infrastructure. In middle and low-income countries, these effects are even more tangible and pressing. As media have the unique power to set topics and tone of public discussion, journalism plays a very important role in a complete eradication of corruption in public procurement. This however does not always ensure a fair competition. In 2007, a 119 million euro tender was won in Slovakia by a party close to one of the politicians, after it was advertised only on a small pinboard in the Ministry hallway. Purchasing price of highly specialized products can be however compared in cross-border tenders. Such as the case of an overpriced medical CT scanner purchased in Slovakia for twice the price as a similar CT scanner in Czech Republic.